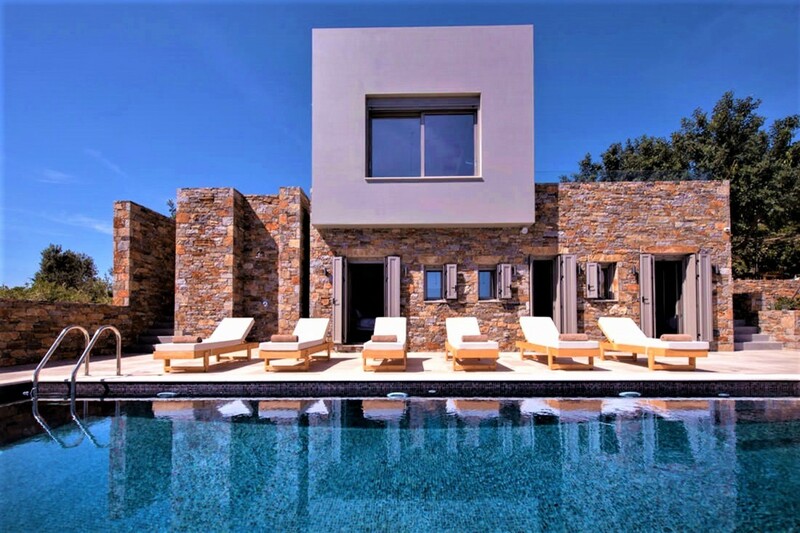 Welcome to Dilos, a 3-bedroom ultra-modern villa nestled in the vibrant area of Elounda in Crete, Greece. This property can hold up to six guests over its contemporary interior space and open exterior gardens. The Villa is based between the town of Aghios Nikolaos and the village of Elounda. It is in a short distance to the famous blue flag awarded Havania beach (200m) in the Mirabello Gulf and offers you captivating panoramic views across the bay. Sit back in your serene villa and watch as the sun plunges behind the glistening Mediterranean Sea leaving the sky fade from a glazed pink to a deep blue. Villa Dilos is the perfect place for you to indulge in a true Greek lifestyle amongst this Cretan landscape. 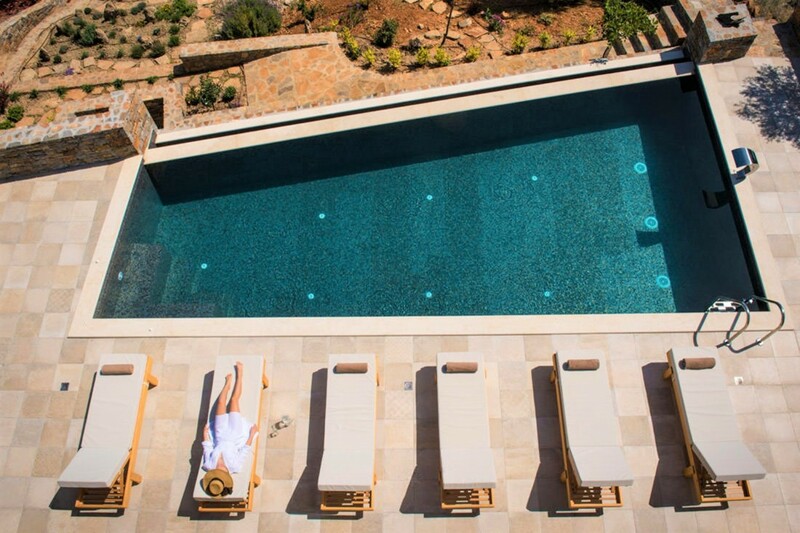 Perched sitting peacefully above the glistening blue Aegean Sea, villa Dilos is a contemporary newly built villa which provides a serene and relaxed ambiance overlooking the sea. The villa is built using a very modern architectural layout and design. The villa’s amazing views and uncompromising location make it the finest choice for our most distinguished guests. Situated only 200 meters away from the blue flag awarded Havania beach this luxury villa offers extraordinary access to the sandy shores and exquisite views across the bay. Taking steps outside into the area surrounding your secluded villa, your eyes will instantaneously fall upon the crisp blue pool. Look out into the turquoise waters of the Mediterranean Sea and into the endless horizon protected by the majestic mountains. You can simply relax on the soft sun loungers as you soak up the suns warmth or slip into the calm waters if you get too warm. The pool is equipped with a waterfall and hydro-massage for your comfort. The refreshing ambiance will melt away your stresses as you float here and indulge in the extraordinary views across the bay. Enjoy a sunset cocktail by the pool or light up the barbeque for a sizzling meal and some outdoor dining. The dining area can seat up to six guests. 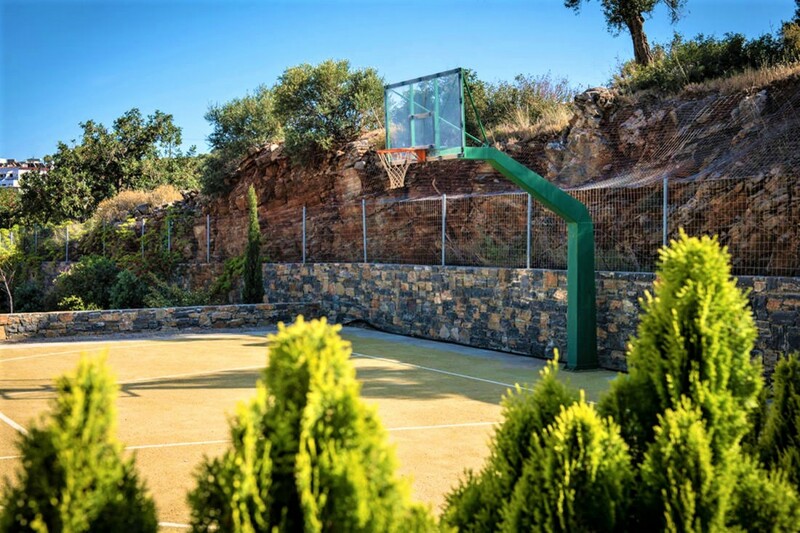 If you want to make use of the basketball training court close by then why not have a quick game during the afternoon. Allow the cool breezes to skim across your skin as you live the Greek island lifestyle in the comfort of your own villa by the bay. 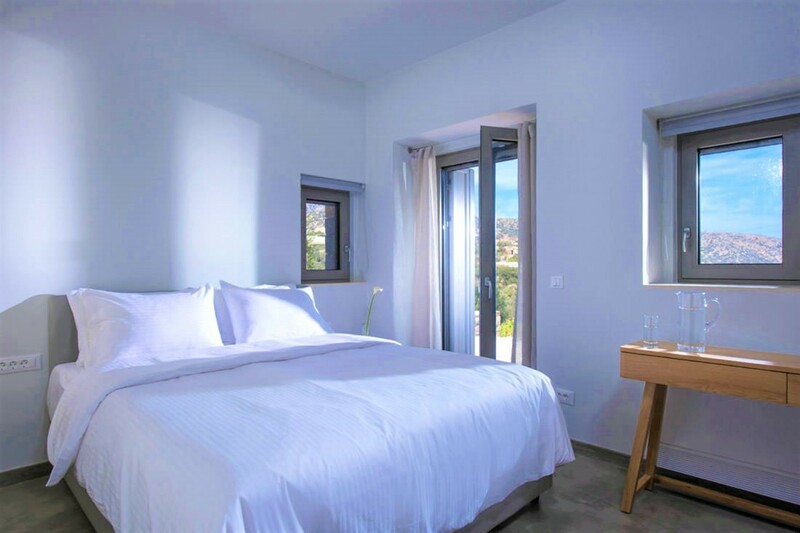 Dilos is a very contemporary property. The interior space spans across a total of 180sq. meters and features three luxurious bedrooms over the two floors. This contemporary residence offers panoramic views of wonderful sunrises and sunsets against backdrops of the Mediterranean Sea and the Cretan landscape. The architecture, sophisticated furnishings, and beauty of the surroundings combine to make this villa unique. The entrance level is where you will locate the lavish living areas. This space is sleek and stylish, fitted with indulgent luxurious features. 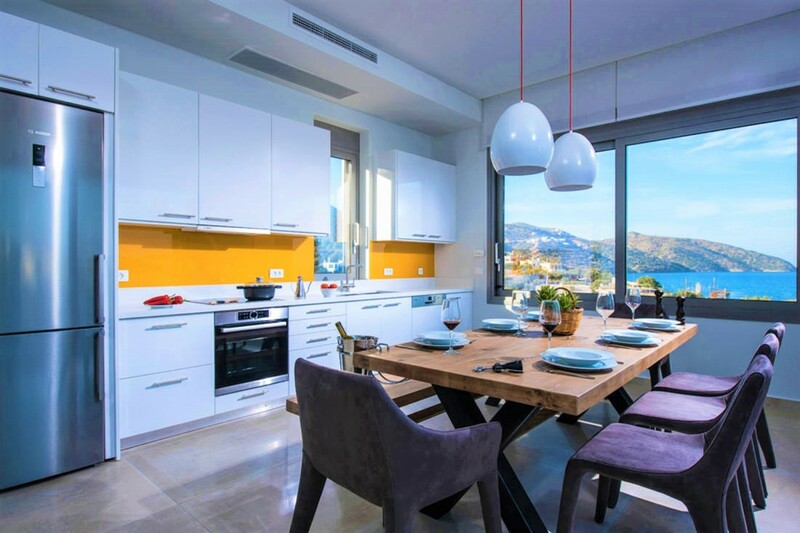 The kitchen and dining area looks over the ocean views and are very open due to the high-rise ceilings and large windows. The room is flooded with natural light and warmth. The caramelized dining table can seat up to eight of your guests and the kitchen comes fully equipped and ready for you to use. The Kitchen is designed in a bright bold yellow color which adds vibrancy to the room. Taking a step up into the slightly raised living area, this room is fitted with large plush sofas and a beautiful fireplace. The living area is fitted with a high-resolution smart Television. In the cooler seasons, you can snuggle up on the couch, light the fire and watch your favorite film. There is a private veranda located on the entrance level and it the perfect spot to watch the stars spark up the night sky. There is a guest bathroom located on this level as well as a small storage room. Delving into the details of the bedroom, these rooms are all located on the ground floor which is the pool level of the villa. You will first discover the Master Suite which has a large comfortable double bed. The room is very modern and pristine. It is fitted with a private en-suite bathroom. There are two more bedrooms located on this floor, one double bed and one single bed with an additional pull out bed underneath. These two bedrooms share a bathroom. 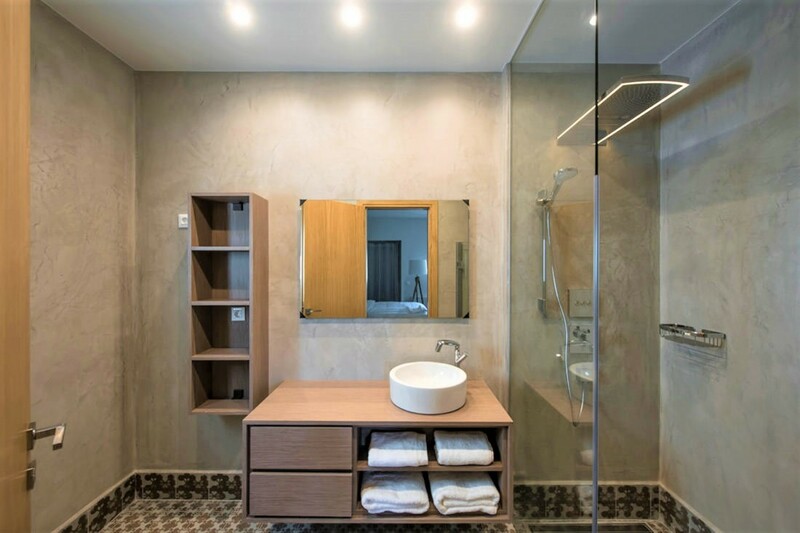 There is also a laundry facility room and a luxurious private sauna for you and your loved one to enjoy in the Villa. 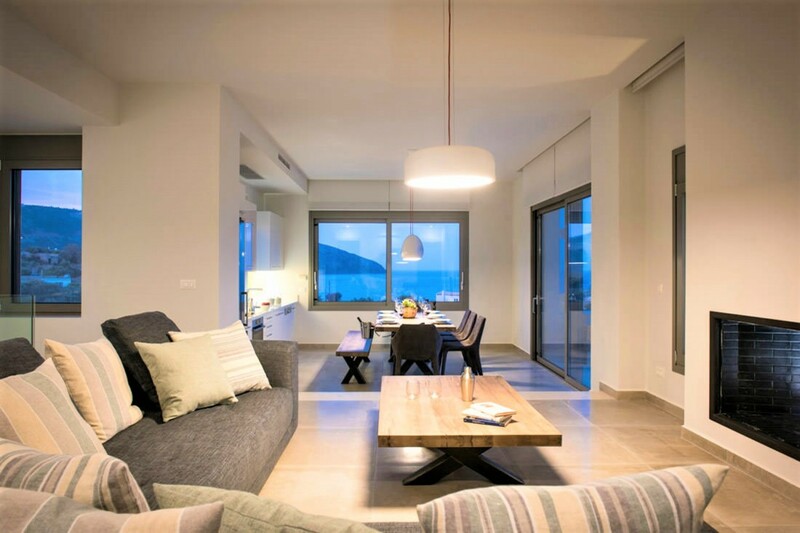 Dilos is nestled in the vibrant area of Elounda in Crete, Greece. 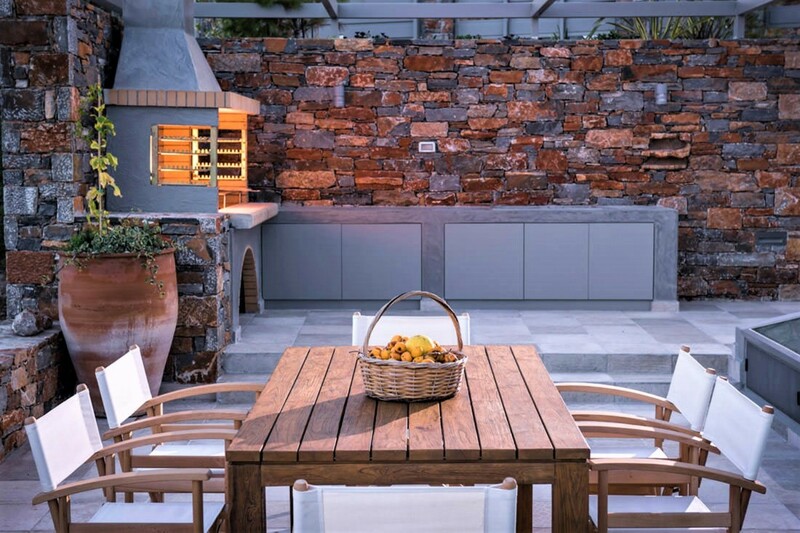 The Villa is based between the town of Aghios Nikolaos (2.5) and the village of Elounda. It is in a short distance to the famous blue flag awarded Havania beach (200m) in the Mirabello Gulf and offers you captivating panoramic views across the bay. Sit back in your serene villa and watch as the sun plunges behind the glistening Mediterranean Sea leaving the sky fade from a glazed pink to a deep blue. 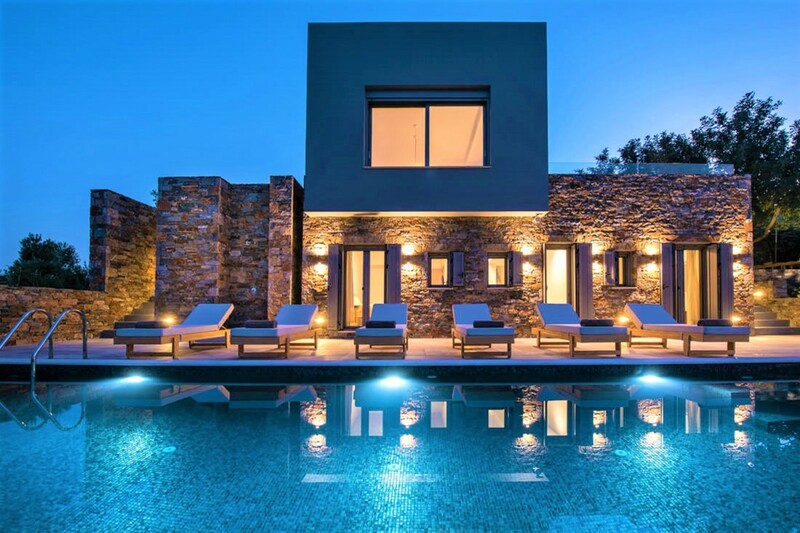 As this villa is situated in this special area of northeastern Crete, it offers spectacular of wonderful sunrises and sunsets across the Bay of Elounda. 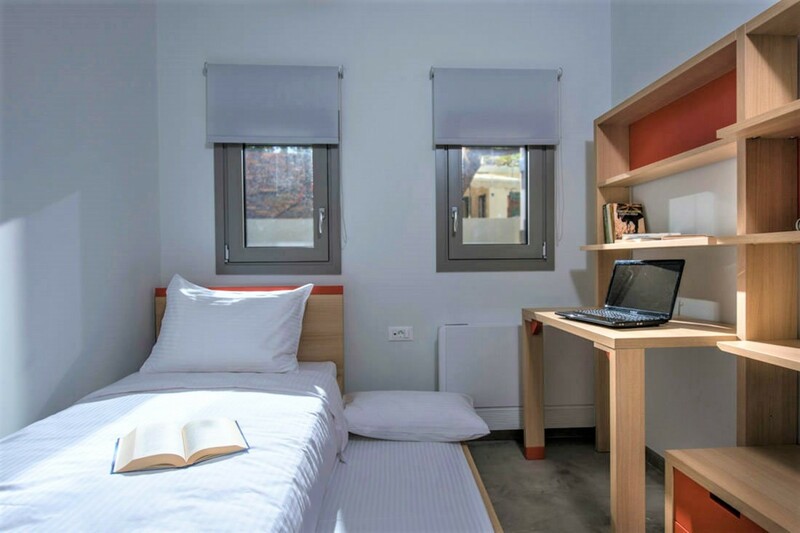 For more specific details about the location of Villa Dilos: The villa is based 60 km from the Heraklion Airport and 205km from Chania Airport. The Port is 64km away in total. The local town of Plaka Village is situated 2km from your doorstep, a short five-minute drive. Here you will find shops, restaurants and a vast variety of amenities for you to make use of during your stay. The nearest restaurant lies at 0.5km at your doorstep, and the shops are only 2.5km, both within a five-minute drive if you ever need anything. The beachfront of Havania beach is only 200m from your private villa making it a short five to ten minutes stroll, or simply a two-minute drive. Another beach you can visit is Mirabello Beach which is a little further at 2.5km. Bedroom 1 Master: Luxurious Master suite, Large Double bed with a private en-suite bathroom attached, access to the private terrace and pool area.